I mean, they look fiery, don’t they? 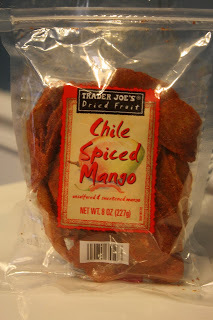 Did I eat the entire bag of Trader Joe’s Chile Spiced Mango slices in one day? Yes. Did it taste very good? Not really, no. My ongoing struggle with the world’s most addictive fruit has been well documented. If there is mango in my house, dried or otherwise, there is an increasingly likelihood, day by day, that I will enter a mango frenzy, stuff it all into my mouth and once, then burst into the streets looking for more. Even now I feel the mango-craving beast within stirring in my breast, it’s insatiable hunger for mango only whetted by this offering. I hold it safely in check – for now. If the chile spiced mango had been a tastier treat, it’s unlikely that would be the case. A brief lapse in my mango defenses resulted in me buying this sachet of dried fruit the other day. The chili spiciness is what got me. Faithful readers might remember this post about chile spiced dehydrated pineapple from early on. The ecstasy of that sweet napalm still tingles on the edge of my tongue, and the thought of that but in mango form was a lure I could not resist. Sadly, the reality was a faint shadow of the dream. my favorite way to enjoy fresh fruit, but certainly a tasty option. My hope was that Trader Joe’s, with their network of chefs and deep coffers, would have perfected this local delicacy. What I got was something no self-respecting street vendor would give you. Trader Joe’s Chile Spiced Mango is bland. With every bite you’re expecting a blast of intense hotness, tempered by the profound amplitude of succulent mango. This is what you never get. This is the worst dehydrated mango I’ve had from TJ’s. The mango taste is subdued and flat, not so much hidden by the chile powder as absent all together. 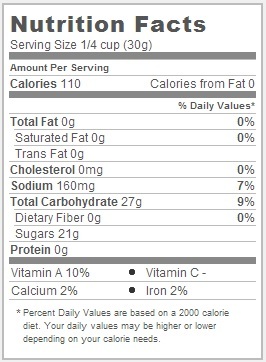 Meanwhile, the chili powder itself is practically impotent. I get that when you’re selling to a national market you need to tone down the heat, but I’ve had mild salsa with more kick than this chili pepper. There’s a brief hint of fire, like a match threatening to light, that immediate vanishes into a dusty, indistinct taste. It’s two ingredients, Trader Joe’s! If you’re going to spice something with chili powder, actually spice it. If you’re going to use mango, then let us taste the mango. Yes, I’ll eat the entire bag (it is mango after all), but I’m not going to like it. Would I Recommend It: Not unless you like bland mango. Would I Buy It Again: Not until it’s the last mango available to me on Earth. Then yes.